MES is designed mainly for teachers, but there are many useful resources there for parents. MES stands for Mighty Education Systems. It's actually a network of sites with titles like Free Printables for Teachers, Printable Certificates, and Stickers and Charts (thousands of free printable stickers). I'm always looking for great literacy resources. 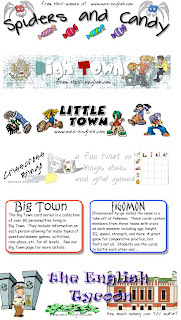 Inside Free Printables for Teachers, I found an interesting Games page. I liked the Skit Kit, which encourages kids to make up a story, a dialogue or a skit, based on words presented in the form of images on flash cards. The cards are free to download in the form of a pdf, but like all of MES materials, are strictly for personal use only. The art work is quirky and cartoonish, making the cards ideal for parents who want to create word recognition, bingo, and other games. I liked the sound of a spelling game, Unscramble It! too. There's a Dice Maker at the sister site, Tools for Educators. It's a worksheet wizard, that allows you to put in your choice of words and images for dice, and that generates a template you can print out, fold and glue. MES can really save you time looking for suitable clip art for games, because images are grouped in themes. Remember the copyright belongs to MES, so you can't publish them anywhere.